Early marsupial conceptuses differ markedly from those of eutherian mammals, especially during cleavage and early blastocyst stages of development. Additionally, in marsupials the zona pellucida is surrounded by two acellular layers, the mucoid coat and shell, which are formed from secretions from the reproductive tract. We report the identification of a novel postovulatory coat component in marsupials, which we call uterinesecreted microprotein (USM). USM belongs to a family of disulfide-rich microproteins of unconfirmed function that is found throughout deuterostomes and in some protostomes, and includes β-microseminoprotein (MSMB) and prostate-associated microseminoprotein (MSMP). We describe the evolution of this family in detail, including USM-related sequences in other vertebrates. The orthologue of USM in the tammar wallaby, USM1, is expressed by the endometrium with a dynamic temporal profile, possibly under the control of progesterone. USM appears to have evolved in a mammalian ancestor specifically as a component of the postovulatory coats. By analogy with the known properties of MSMB, it may have roles in regulating sperm motility/survival or in the immune system. However, its C-terminal domain is greatly truncated compared with MSMB, suggesting a divergent function. Marsupial conceptuses are surrounded by three extracellular investments (reviewed ). The innermost layer, the zona pellucida, is deposited during oogenesis and occurs in all mammals. After ovulation and fertilisation, it becomes surrounded by a thick, translucent layer mucoid coat that is deposited during passage through the oviduct and traps non-fertilising sperm. By the time the conceptus arrives in the uterus, the mucoid coat has become surrounded by a thin, dense, shell coat derived mainly from secretions in the utero-tubal junction and the uterus [2–4]. During the period we define as "preliminary blastocyst expansion", the mucoid coat narrows as it becomes compressed between the expanding zona pellucida and the outer shell coat. During "secondary expansion", the shell coat itself expands from an initial diameter of about 200-300 μm up to ~17 mm, increasing its volume dramatically from 0.001 mm3 to > 0.250 mm3 . The shell coat finally ruptures approximately two-thirds of the way through pregnancy, or 3-8 days before birth , under the influence of proteases secreted by the endometrium , after which attachment occurs. A previous study  made substantial progress in identifying components of the postovulatory coats of the brushtail possum (Trichosurus vulpecula) and the stripe-faced dunnart (Sminthopsis macroura). The authors isolated individual protein components by electrophoresis and sequenced their N-terminal regions. The short sequences obtained (12-15 residues) for twelve excised protein bands (seven from possum and five from dunnart) could not initially be identified due to insufficient bioinformatic resources for these species at the time. Since that study, one band was identified as similar to τ-crystallin/enolase 1 and termed CP4 (coat protein 4) . Genomes have now been sequenced from two marsupials - the South American grey short-tailed opossum (Monodelphis domestica) , and more recently the Australian tammar wallaby (Macropus eugenii) (in press). With these new resources at hand, we re-examined the published protein sequences of Casey et al. and identified one of them from the brushtail possum. We show that the gene encoding this protein, which we call uterinesecreted microprotein (USM) is a paralogue of MSMB (β-microseminoprotein; also called PSP94, β-inhibin and IgBF). MSMB is a disulfide-rich, low molecular weight protein that is a major component of seminal fluid and is strongly expressed in the prostate gland as well as in other tissues, especially of the reproductive system and in mucosal membranes. Its specific function is not known, but it may have roles in inhibition of sperm motility [10, 11], suppression of immune response against allogeneic sperm , toxin defence [13, 14], pituitary-gonadal axis signalling [15–17] and suppression of prostate tumorigenesis [18–22]. Very little is known of MSMP, which is similar to MSMB but more highly conserved among species, apart from its expression in a prostate cancer cell line . 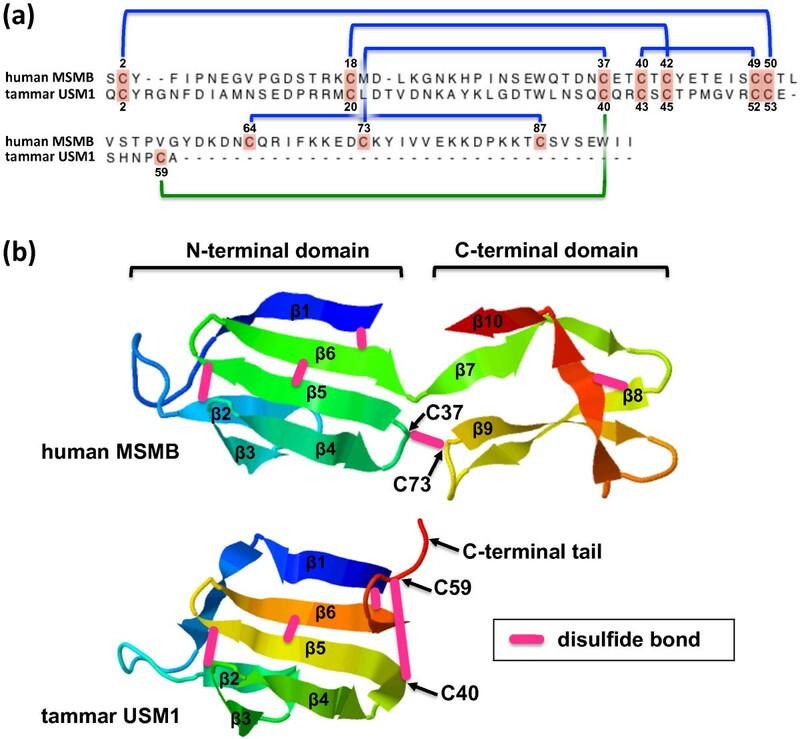 USM is similar to both MSMB and MSMP in its conserved sequence of disulfide bond-forming cysteine residues, but most of the region homologous to the C-terminal domain of MSMB is absent. In this study, we examine the evolution of USM/MSMB/MSMP-related microproteins in vertebrates. We discuss how, as a component of the marsupial postovulatory coats, USM could provide important clues for elucidating the roles of MSMB and other related proteins, with possible applications in prostate cancer, immunity and fertility control. Protein sequences from Casey et al  were used to search GenBank databases using the tBLASTn algorithm with low-stringency search parameters. The alignments of sequences from Casey et al  with an expressed sequence tag [GenBank accession EG617409] derived from the reproductive tract of the brushtail possum is shown in Figure 1. The major sequence from Band 5 (14 kDa) matched closely the translated possum EST, while minor sequences from Bands 3 (22 kDa), 4 (17 kDa) and 5 also showed identity. We named this protein uterine secreted microprotein (USM). Identification of a brushtail possum coat protein component from published sequences. Published sequences (boxed) of electrophoresed protein bands from possum postovulatory coats  are aligned with a translation of brushtail possum expressed sequence tag (EST), GenBank accession EG617409, highlighted in blue. Aligned residues between the translated EST and the major sequence of band 5 are shown in red. Additional residues within the sub-sequences of bands 3-5 that also match the EST are shown in green. In bands 3 and 5, these are one residue out of phase. The approximate molecular weights indicated are those estimated by Casey et al. . The translated sequence of the possum EST was used to identify exons in the tammar wallaby (Macropus eugenii) whole genome shotgun (WGS) database, which revealed an apparent four-exon structure with an open reading frame spanning Exons 2-4 (Figure 2). A second, more divergent homologue was also identified bioinformatically. We refer to these genes respectively as tammar USM1 and USM2. Conserved exons in the opossum genome were identified as a homologue of USM. Sequence and translation of tammar USM1 and opossum USM aligned with brushtail possum EST. Note that the "first exon" in the brushtail possum EST is excluded from this alignment, as it appears to be an artefact (see text). Sequences extend from the transcription start site, determined for tammar USM1 by 5' RACE, to the predicted polyadenylation signal. The signal peptide cleavage site is indicated by an arrowhead. Exon 1 of tammar USM1 was determined by 5' RACE and differed from that of the brushtail possum EST. In the opossum genome, Exons 2-4 of the brushtail possum EST map to Chromosome 1 whereas the "first exon" maps to Chromosome 8, immediately upstream of the third exon of another gene, WASH1. To resolve this discrepancy and to characterise fully the genomic locus of tammar USM1, we isolated and sequenced a tammar genomic BAC clone containing the gene. In a single assembled 89.8-kb contig of BAC sequence [GenBank accession JN251945], no sequence matching the "first exon" of the brushtail possum EST was present in the 17.1 kb upstream of Exon 2, however Exon 1 as identified by 5' RACE was located upstream of Exon 2, as expected. USM2 was located downstream of USM1 in the BAC sequence and in the same orientation. USM2 also contains exons homologous to Exons 1-4 (Figure 3). We conclude that the "first exon" of the brushtail possum EST represents an anomaly or an artefact of cDNA library construction. Downstream of USM2 and in the same orientation as USM1 and USM2 in the BAC sequence, we identified the first 8 exons of ELP3 (Figure 3), which also flanks USM in the opossum genome. This confirmed that opossum USM is orthologous to the tammar USM1/USM2 cluster. However, unlike in the tammar, no duplicate of USM was found at this locus in the opossum. Structure of sequenced tammar BAC clone. The positions of exons of USM1, USM2 and EPL3 within a single 89.8 kDa contig sequenced from a tammar genomic BAC clone are shown, drawn to scale. Arrows denote the orientation (5'-to-3') of the sense strand of coding regions. A signal peptide cleavage site was predicted at the same position in all three species (Figure 2 and additional file 1: Protein_alignment.pdf), strongly indicative of a secretory protein and consistent with a role in the extracellular postovulatory coats. In the brushtail possum, the predicted cleavage site also immediately precedes the major sequence from band 5 (compare Figure 1 and additional file 1: Protein_alignment.pdf), which was obtained by N-terminal sequencing. In eutherian sequence databases, the highest translated sequence identity with the USM genes was found in orthologues of MSMB and another related gene, MSMP (also called PSMP). USM is not an orthologue of either of these genes, however, as other genes corresponding respectively to orthologues of MSMB and MSMP were identified in both tammar and opossum genomes. Thus USM is a novel mammalian gene that is absent in the eutherian lineage. The four-exon structure of marsupial USM genes is similar to that of MSMB, including a predicted translation initiation codon in the three 3'-most nucleotides of Exon 1 (Figure 4). USM and MSMB both differ from MSMP, which is comprised of only three coding exons, homologous to USM/MSMB Exons 2-4. Thus for ease of comparison, the exons of MSMP are hereafter referred to according to their homology with USM/MSMB exons. The full coding region and splicing structure of tammar USM1 was confirmed by RT-PCR followed by cloning and sequencing (not shown). Comparison of exon structure of selected USM/MSMB/MSMP family members. Regions encoding the signal peptide and N- and C-terminal domains are indicated. Filled boxes represent coding regions. Numbers represent nucleotide lengths. To examine the evolution of the MSMB/MSMP/USM gene family, we performed low stringency tBLASTn searches of GenBank databases and identified numerous homologues in vertebrate genomes as well as in those of lower deuterostomes, including Ciona spp. (Urochordata), Branchistoma lanceolatum (Cephalochordata) and Stronglyocentrotus purpuratus (Echinodermata), and of protostomes, including those recently reported in the phyla Mollusca and Rotifera . (See additional file 2: Sequence_sources.pdf for sources of all sequences used in this study.) Most of the identified genes were previously unreported. Alignment of a large number of translated sequences (not shown) suggested a complex pattern of evolution with rapid sequence changes and gene duplication events. As previously reported , MSMP showed the strongest conservation among vertebrates. Because of the large number of amino acid substitutions, the phylogenetic relationship between family members from distantly related species was not readily resolved by standard bootstrapping methods, with the exception of MSMP-like genes (not shown). Nevertheless, three broad sub-families appeared to be represented among vertebrates: MSMP-like, MSMB-like and USM-like(see additional file 3: Tree.pdf). To clarify the relationships among MSMB/MSMP/USM family members, we examined their conservation of synteny with flanking genes. We focussed particularly on MSMB-like and USM-like genes as they showed the most sequence variability. The most informative syntenic groups are summarised in Figure 5. Regions of conserved synteny among vertebrate genomes. Only some genes, whose position within a syntenic group is informative, are shown. Thus a small number of intervening genes lie between some genes that are depicted as directly flanking for simplicity. Larger intergenic distances are depicted by parallel diagonal lines. Key genes mentioned in the text are highlighted in colour. In the opossum genome, USM flanks ARID5A while 14 tandem copies of MSMB flank FAM21C and ANUBL1. In the chicken, 3 tandem copies of MSMB also flank FAM21C and ANUBL1, which are located near ARID5B (a paralogue of ARID5A) on chromosome 6, whereas no MSMB/USM-like gene is located near ARID5A on chromosome 22. By contrast, USM-like genes lie close to ARID5A in the lizard genome and arid5a in the zebrafish genome. This suggests that the same duplication event that generated ARID5A and ARID5B also generated USM-like and MSMB-like genes, respectively. This duplication event can be traced to prior to the divergence of the teleost fish lineage (which has also undergone its own genome duplication event ) and is associated with the generation of other paralogous pairs (ANTRX1/ANTRXL and others not shown) that variably cluster with ARID5A/ARID5B in vertebrate genomes (Figure 5). Both of these paralogous syntenic groups variably contain a homologue of PPYR1, with some lineages (such as lizard and zebrafish) containing a homologue in both syntenic groups. The presence of paralogous syntenic clusters conserved throughout vertebrates allowed orthologues of USM to be clearly identified. Among non-mammalian tetrapods, the most similar sequence to USM found was from the genome of the green anole lizard (Anolis carolinensis). 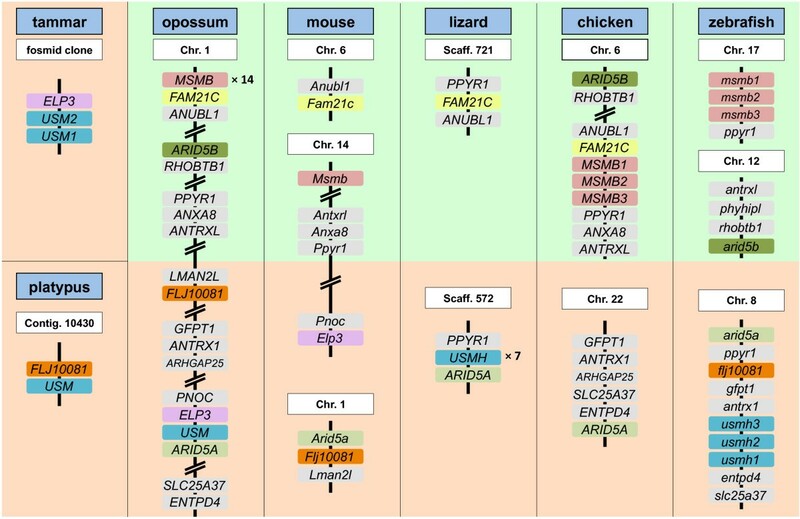 Multiple copies of USM-related genes in the lizard flank ARID5A, as does opossum USM and a cluster of three USM-like genes in the zebrafish genome (Figure 5). These genes appear to be orthologous with respect to their origin, thus we refer to the lizard genes as USMH1 to -7 (USM homologue 1 to 7) and the zebrafish genes as usmh1 to -3 (USM homologue 1 to 3). They may not have equivalent function to USM, however, as the lizard and zebrafish genes have retained a complete Exon 4 encoding the C-terminal domain, in contrast to marsupial USM genes in which the open reading frame encoding this domain is greatly truncated. They also have four coding exons (Figure 4), which is supported by transcript evidence (see additional file 2: Sequence_sources.pdf). Published cDNA sequences from the Habu snake (Trimeresurus flavoviridis)  are similar to the lizard USMH genes. Like the lizard and zebrafish USMH genes, the snake genes are more similar to each other (not shown), suggesting that they also represent a lineage-specific expansion in copy number. These genes encode small serum proteins, SSP1-5, which appear to have a role in protection against the snake's own venom rather than in reproduction [13, 14]. USMH-like sequences were also found in cDNAs derived from mixed tissues of the channel catfish (Ictalurus punctatus). According to the NCBI UniGene EST expression profiles, zebrafish usmh transcripts are found largely in the reproductive tract and consist mostly of usmh2 and usmh3 transcripts. Although it is possible that USMH proteins in other vertebrates also contribute to postovulatory coats, this appears unlikely due to their apparent additional expression in non-reproductive tract tissues. Furthermore, no specifically USM-like sequences were identified in the two sequenced avian genomes, chicken (Gallus gallus) and zebra finch (Taeniopygia guttata), in which conservation of postovulatory coat proteins might be expected. Thus it appears that a USMH gene evolved a novel role in the postovulatory coats of a common mammalian ancestor. An apparent orthologue of USM is also present in the genome of the platypus (Ornithorhynchus anatinus), based on sequence similarity of Exons 1-3 and proximity to an orthologue of Flj1008, which also flanks Arid5a on mouse chromosome 1 (Figure 5). However platypus Exon 4 could not be identified either manually or using gene prediction software, thus it could not be determined whether it encodes the same C-terminal truncation as marsupial USM. Our failure to detect Exon 4 argues that it probably has a truncated open reading frame and therefore platypus USM is likely to be functionally equivalent to marsupial USM rather than other vertebrate USMH genes. Our phylogenetic analysis of avian MSMB homologues revealed three distinct but previously unrecognised paralogous groups. The three chicken paralogues, which we term avian MSMB1, MSMB2 and MSMB3, flank each other on chromosome 6. Thus unlike in New World monkeys , in which multiple copies of MSMB appear to have arisen independently, avian MSMB paralogues are apparently conserved. Furthermore, each avian MSMB paralogue shows high conservation in its translated sequence with its respective orthologues. Previously characterised sequences from chicken and ostrich (Struthio camelus) designated as MSMB [15, 28] correspond to MSMB1, while the gene currently annotated as MSMB by the NCBI "Gene" database http://www.ncbi.nlm.nih.gov/gene?term=msmb%20gallus corresponds to MSMB2. A partial transcript of MSMB3 from chicken [GenBank accession DT655693] is annotated as being derived from reproductive tract ("testis, ovary and oviduct"), while a full transcript from duck (Anas platyrhynchos) [GenBank accession HO188240] was derived from a screen for genes expressed in the epithelium of the magnum (part of the reproductive tract) and correlated with high egg hatchability . Avian MSMB1-3 genes differ markedly from each other in their degree of conservation. Translated sequence identities of the MSMB paralogues of zebra finch (order Passeriformes) were compared with their respective orthologues from Anseriformes (duck) and/or Galliformes (chicken, duck and turkey), the latter two orders forming a monophyletic clade . Conservation is notably higher among MSMB3 orthologues (81-82% amino acid identity) compared with MSMB1 (54-60%) and MSMB2 (53-56%) (see additional file 4: avian_MSMBs.pdf for table of sequence identities and similarities). The pattern was similar when comparing within Galliformes (chicken versus turkey): 83% amino acid identity for MSMB1, 89% for MSMB2 and 98% for MSMB3. Mouse Msmb is more similar to avian MSMB2 (32-36% amino acid identity) than either MSMB1 (25-28%) or MSMB3 (23-25%). 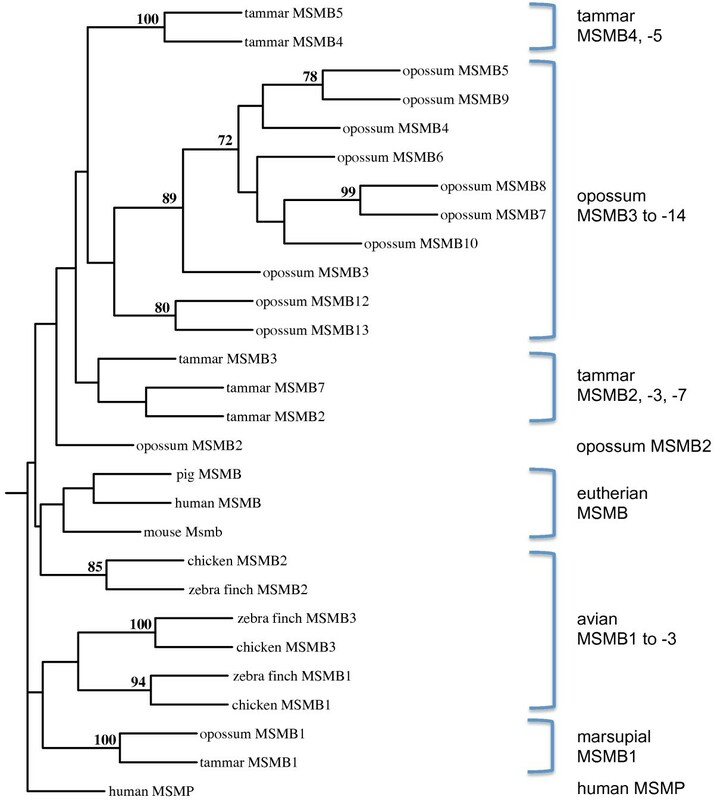 These data suggest that avian MSMB3 has acquired a novel, specialised role in birds distinct from that of other vertebrate MSMB homologues. Considering the tissue source of the only two known transcripts, this role is likely to be related to reproduction. Ostrich MSMB1 was originally identified in the pituitary gland , supportive of a previously proposed role in the pituitary-gonadal axis [17, 19, 20], although this role was later refuted [31, 32]. In the opossum, we identified fourteen paralogues of MSMB, which we termed MSMB1 to -14, flanking each other on chromosome 1 (Figure 5). Similarly in the tammar, we identified at least ten presumed MSMB paralogues, although not all exons could be identified and their synteny could not be confirmed. One tammar homologue, designated MSMB1, is very similar to opossum MSMB1 and presumably orthologous to it. MSMB1 from tammar and opossum are strongly divergent from the other MSMB homologues of both species and are significantly longer within Exon 3 (not shown). Thus only the MSMB paralogues that flank MSMB1 (presumably in tammar as well as opossum), but not MSMB1 itself, have undergone multiple duplications independently within each lineage. The above conclusions in birds and marsupials are supported by phylogenetic analysis (Figure 6). Significant (> 70%) bootstrap values were obtained supporting orthology of avian MSMB1, -2 and -3, respectively, between chicken and zebra finch, and of marsupial MSMB1 between opossum and tammar. No marsupial homologues other than MSMB1 showed significant bootstrap values between tammar and opossum, whereas homologues from the same species tended to cluster together within the phylogenetic tree, indicative of lineage-specific duplication events. Phylogenetic analysis of MSMB homologues in selected amniotes. The phylogenetic tree was generated using translated sequences of Exons 3-4 from selected MSMB homologues (marsupial homologues with incomplete sequences were omitted), using the neighbor-joining method with 1000 replicates. Only bootstrap values of greater than 70% are shown at branching points. Human MSMP was used as an outgroup. Protostomal MSMB-like genes were identified mostly from the phylum Mollusca, including bivalves, gastropods and cephalopods, with one sequence from Rotifera. Additional identified transcript sequences were from a cDNA library derived from floral bulbs of Lewis' monkeyflower (Mimulus lewisii), a flowering plant. These are assumed to have arisen from contamination of the floral buds by a terrestrial gastropod (a slug or a snail) (H.D. Bradshaw, pers. comm.). Phylogenetic analysis of all the protostomal MSMB-like translated sequences did not entirely reflect the species' taxonomic relationship (Figure 7), suggesting that not all the sequences are orthologous to each other. Most notably, the similarity between a sequence from a cephalopod, Euprymna scolopes, and the "Mimulus lewisii" (presumed terrestrial gastropod) sequence is stronger (100% bootstrap) than between any other sequence pairs, including between congeneric species (92% for Loligo spp. ; 25% for Mytilus spp.). This suggests that the former sequences represent a gene that is subject to more evolutionary constraints, similarly to MSMP in vertebrates. Indeed, the sequences from Euprymna scolopes and "Mimulus lewisii" appear to share some features that are highly conserved in vertebrate MSMPs, such as a serine-alanine motif near the C-terminus (not shown). Thus it is possible that these two sequences represent distant orthologues of MSMP. Phylogenetic analysis of MSMB -related genes in protostomes. Translated sequences spanning only from the N-terminus of the secreted protein to the last conserved cysteine residue were aligned. The unrooted tree was produced by the neighbor-joining method with 1000 replicates. Significant bootstrap values (> 70%) are shown in bold. * The sequence for "Mimulus lewisii" is presumed to represent a terrestrial gastropod (see text). The California sea hare (Aplysia californica; Gastropoda) is the only mollusc currently with a WGS sequencing project. The sea hare MSMB-like sequence is located on the same genomic scaffold (Scaffold 217 of genome build Broad 2.0/aplCal1) as a member of the KLHL (Kelch-like) gene family. KLHL genes also respectively occupy the syntenic groups that include MSMB or USM/USMH in vertebrates (not shown). Together these data suggest a divergence between the MSMP and USM/MSMB lineages in a bilaterian common ancestor. 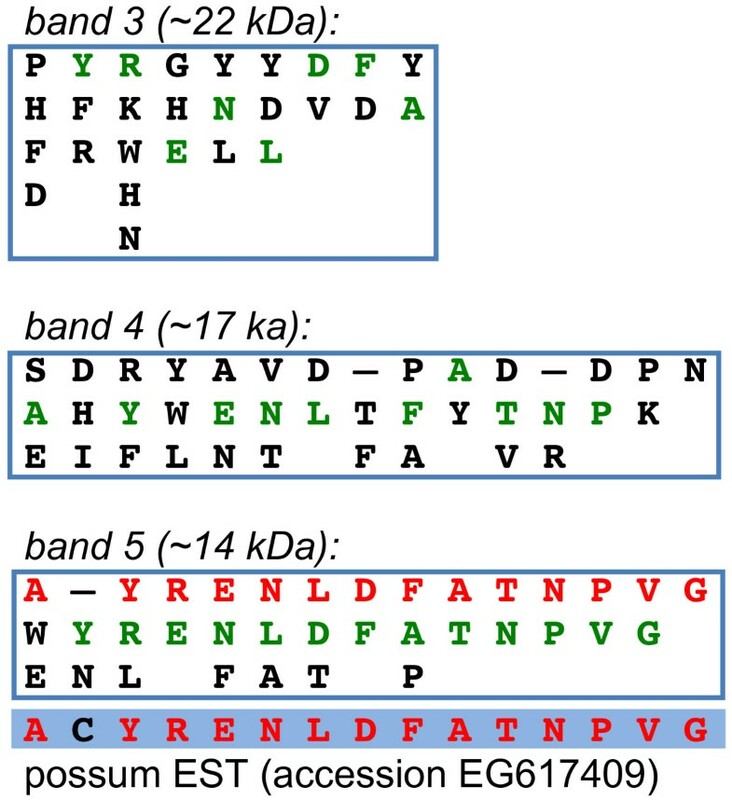 Almost all USM/MSMB/MSMP family members share a conserved pattern of ten disulfide-forming cysteine residues, whereas marsupial USM has only eight cysteine residues due to a truncated reading frame in Exon 4 (Figure 8a). The disulfide bond pairings of cysteine residues has been partially determined  and then later refined [33, 34]. A recent crystallographic analysis of human MSMB  showed that the N-terminal domain consists of six β-strands (β1-6) arranged in a Greek key motif, while the C-terminal domain consists of four β-strands (β7-10). Three disulfide bonds (6 cysteine residues) give rigidity within the N-terminal domain and one disulfide bond (2 cysteine residues) gives rigidity within the C-terminal domain. A fifth, single disulfide bond between C37 and C73 links the N-terminal and C-terminal domains. In marsupial USM, the cysteine residue homologous to C37 (= C40 in tammar secreted USM1) is conserved, despite the absence of C73. However, an additional cysteine residue (= C59 in the tammar secreted protein) is present within the short, six-residue C-terminal domain of all marsupial USM orthologues. Modelling of the tammar USM1 tertiary structure showed that this cysteine residue would lie very close to C37 and substitute for the missing C73 (Figure 8b). Predicted tertiary structure of tammar USM1 modelled on human MSMB. (a) The secreted forms of human MSMB and tammar USM1 (predicted) are aligned with the N-terminal domain (above) and the C-terminal domain (below). The ten cysteine residues in MSMB (highlighted in pink with positions indicated) form five disulfide bonds as shown (blue lines). Cysteine residues homologous to C64, C73 and C87 are absent in USM1 due to its C-terminal truncation, leaving C40 in USM1 (homologous to C37 in MSMB) unpaired. We suggest that an additional C-terminal cysteine residue (C59), also conserved in brushtail possum and opossum, instead forms a disulfide bond with C40. (b) The secreted forms of human MSMB (monomer) and tammar USM1 modelled on the crystal structure of human MSMB  (Protein Data Bank accession code 3IX0) using ESyPred3D [65, 66] and displayed as a cartoon with β strands in rainbow colour using Jmol . The approximate positions of disulfide bonds are indicated by pink bars. Predicted disulfide bonds in tammar USM are shown in homologous positions. It is evident that C40 and C59, which lies within the short, flexible C-terminal tail, are in close proximity and likely to form a disulfide bond. The precise role of USM in the marsupial postovulatory coats is an intriguing question considering the various roles that have been proposed for MSMB. While MSMB was first identified almost three decades ago as a component of human seminal plasma with FSH-inhibiting activity , there has been a recent resurgence in interest due to a demonstrated genetic link with prostate cancer susceptibility [37–40]. Perhaps more relevant to the present context, MSMB has been shown to inhibit sperm binding and the acrosome reaction [11, 41], suggestive of a possible role in blocking polyspermy in marsupials. To elucidate distinctions in the roles of USM, MSMB and MSMP in the tammar, RT-PCR was performed on a variety of tissues (Figure 9). USM1 expression was detected solely within endometrium and not in other tissues, including oviduct. This is consistent with a highly specific role for USM1 as a component of the postovulatory coats. MSMB expression was detected in both pituitary gland and testis, while MSMP expression was restricted to testis only. Expression of USM2 was not detected in the tissues tested. RT-PCR expression of tammar USM1, MSMB1 and MSMP in various tissues. USM1 expression was detected more strongly in endometrium but not in any other tissues, consistent with a specific role in the postovulatory coats. MSMB1 and MSMP were both expressed in testis, while MSMB1 was also expressed in the pituitary gland, consistent with a possible role in the pituitary-gonadal axis. Expression of USM1 was examined by quantitative RT-PCR during gestation (Figure 10). Transcript levels were moderate-to-high during pre-diapause (days 0-7 after birth of previous young), diapause, and early post-diapause (until day 17-18 after blastocyst reactivation by removal of pouch young (RPY)). Levels were higher during diapause than pre-diapause and the earliest post-diapause stages, although these differences were not significant. By contrast, the second peak at around d10-15 RPY was significantly higher than d4-d6 RPY and d20-25 RPY. After d15 RPY there was a rapid reduction in USM1 transcript levels, which coincides with shell breakdown at around d18-19 RPY . Quantitative RT-PCR analysis of USM1 expression in endometrium during tammar development. Pre-diapause stages are indicated by the age of the pouch young (PY) arising from the previous pregnancy, with blastocysts entering diapause when PY are around day 8 (d8). 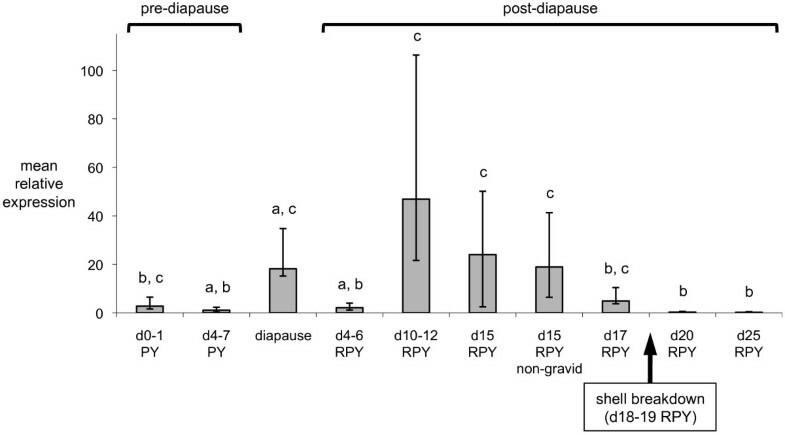 Post-diapause stages are indicated by the days after removal of pouch young (RPY) to initiate blastocyst reactivation. USM1 shows dynamic changes in expression during the pregnant oestrous cycle. The large reduction in expression to basal levels after d17 RPY correlates approximately with the period of shell breakdown (d18-19 RPY) as indicated. The dynamic temporal expression pattern of USM1 during gestation suggests that it may be at least partly regulated by progesterone - indeed we identified a progesterone receptor binding site within the first intron that was conserved in both tammar and opossum (not shown). In the tammar, progesterone receptors are highest at around d5 RPY, together with oestrogen receptors, coinciding with the progesterone and oestrogen pulses that occur at this time . Interestingly this is exactly when USM1 is at its lowest level before increasing again. USM1 expression is also low after d20 of pregnancy (Figure 10), at the time when progesterone concentrations in the corpus luteum , in the peripheral circulation , and in the utero-ovarian circulation  are highest, but progesterone receptor levels are very low . Thus, USM1 expression appears to follow the profile of progesterone receptor levels rather than of progesterone. The mucoid layer is deposited during passage through the oviduct whereas shell coat material is secreted from endometrial glands within the uterus and the uterotubal junction. The association of MSMB expression with mucosal epithelia  suggests that USM might contribute to the mucin layer, however, the brushtail possum protein bands isolated by Casey et al. were derived from a mixed pool of coats from early cleavage through to late expansion conceptuses. Coats of the former would be expected to include more mucoid coat while the latter would include more shell coat. The much greater volume of shell coat surrounding late-expansion conceptuses  suggests that shell coat material would predominate in any mixed pool of samples. Indeed, expression in the endometrium but not the oviduct revealed by our RT-PCR data is consistent with contribution to the shell coat rather than the mucin layer, which forms first in the oviduct. Nevertheless, there may be some overlap in the components of both layers, with the physical differences between the shell and mucin coat due to a subset of components that are specific to one or the other. Immunolocalisation studies may clarify the relative contribution of USM to each layer. Many of the known properties of MSMB provide clues as to possible role(s) of USM. In marsupials, intimate contact between conceptus and maternal tissues occurs only late in development, after shell breakdown approximately two-thirds of the way through pregnancy [47, 48]. The binding of MSMB to immunoglobulins  suggests that USM, if it shares this property, may interact with the maternal immune system to modulate its action. The apparently synchronised down-regulation of tammar USM1 with shell breakdown suggests that the former may be a necessary step for subsequent successful implantation. Alternatively, USM1 down-regulation might facilitate shell-breakdown itself. USM could also have an immune role in protection against pathogens within the uterus. We have identified a lysozyme as another component of the postovulatory coats (unpublished data) that may have a similar role in protection against bacteria. Such a role for USM would be consistent with the association of MSMB secretion in mucosal tissues . In eutherians, degradation of mucin on the endometrial surface is associated with a window of receptivity to implantation (reviewed ). Thus it is possible that similar events, including down-regulation of USM expression, are associated with placental attachment after shell breakdown in marsupials. Unlike MSMP, which is relatively well conserved, MSMB is characterised by a rapid rate of evolution. Mäkinen et al. noted that among the multiple copies of MSMB in New World monkeys, the second intron is more highly conserved than the exons and there is no bias towards substitutions in the third nucleotide of codons, which normally preserve amino acid identity. Thus it is possible that rapid change in the primary structure of MSMB, excluding the signal peptide and the cysteine residues, is under positive selection. In another study , MSMB was identified in a screen for prostate-expressed genes in primates with a high ratio of nonsynonymous to synonymous substitution rate (dN/dS) - a conservative measure of positive selection. USM is similarly highly divergent among the three marsupial species examined and, like MSMB, its divergence might be due to positive rather than neutral selection. It was previously proposed that MSMB prevents immune attack against allogeneic sperm . A possible extension to this idea may be that the same mechanism also serves to reject heterospecific sperm, as MSMB has been shown to bind sperm and act as an inhibitor of sperm motility and the acrosome reaction [10, 11, 41]. Thus rapid evolution of USM (and MSMB) could be implicated in speciation events by preventing hybridisation with closely related species. A recent report  showed that male longfin inshore squid (Loligo pealeii) detect an MSMB-like protein, Loligo β-MSP, in the capsule of eggs laid on the sea floor. Loligo β-MSP triggers hostile behaviour in conspecific males towards other male squid, demonstrating a possible role in species recognition. It is not clear whether this reflects only a secondary role for Loligo β-MSP in the egg capsule, but the parallel with USM as a component of the marsupial conceptus coats is intriguing, although in marsupials internal fertilisation and development rules out any role for USM in mate selection by males. However, it remains possible that USM within the reproductive tract helps to ensure fertilisation by only con-specific sperm. Some eutherians such as rabbit, horse and some carnivores (reviewed [52–54]) also possess various post-ovulatory conceptus coats, such as a mucoid coat, neozona and gloiolemma (rabbit) or a capsule (horse). It is not known whether any components of marsupial and eutherian mucoid coats are homologous, but our thorough searches in both rabbit and horse genome databases suggest that no orthologues of USM are present. However, other components could be homologous. It also cannot be excluded that MSMB or MSMP have acquired an analogous role in the coats of some eutherians by convergent evolution. It is noteworthy that MSMB expression has also been detected in human endometrium . Very few genes have been identified in marsupials that are absent in eutherian genomes . The identification of USM is thus noteworthy and could be highly relevant to understanding the differences in modes of reproduction between these two major mammalian groups. If USM homologues in non-mammalian vertebrates have a different role to marsupial USM, this would suggest that the latter evolved in concert with mammalian viviparity by supporting in utero development. Conversely, the absence of USM in eutherians suggests the evolution of alternate mechanisms supporting in utero development that caused USM to be redundant, for presumably the same reason that the shell coat became redundant. Very few genes have been identified that are specific to marsupials, one of the three major extant groups of mammals. We have identified one such gene - USM - and attributed to its product a role in the postovulatory coats of the marsupial conceptus. Its likely importance in reproduction has potential applications in fertility control and its high sequence divergence may facilitate species-specificity when targeting wild populations. 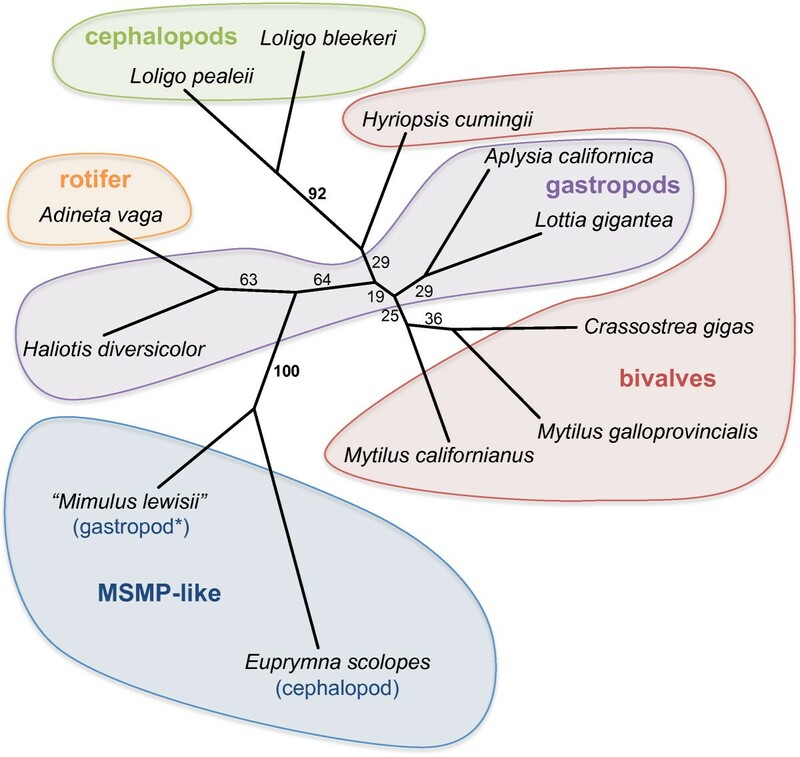 We have also provided the most comprehensive analysis to date of the complex evolutionary relationships between different members of the vertebrate USM-MSMB-MSMP gene family. Despite more than 30 years since the initial identification of MSMB, this gene family remains poorly understood. It has attracted attention in multiple, diverse fields of research, including immunity, reproduction, sexual selection and cancer. Our results provide valuable information that may help to elucidate not only the evolution of viviparity and placental function in mammals, but also the roles of MSMB and MSMP. Tammar samples were collected from animals shot on Kangaroo Island, South Australia, or from captive animals from a colony maintained by the University of Melbourne. Tissues from adult tammars were frozen in liquid nitrogen. All tissues were collected under appropriate permits. Experiments were approved by the University of Melbourne Animal Experimentation Ethics Committee and all animal handling and husbandry was in accordance with the National Health and Medical Research Council of Australia (2004) guidelines. Total RNA was extracted using Tri Reagent (Ambion) and DNase-treated using DNA-free (Ambion). Reverse transcription was performed using the Transcriptor High Fidelity cDNA Synthesis Kit (Roche) with oligo-dT priming. The complete coding region of tammar USM1 cDNA was amplified using the primers 5'-GGGGCACGAATGGGTGTTTATTC-3' and 5'-CCTGAGACACAGAGGAACCAGAGGTACTG-3' and TaKaRa ExTaq polymerase according to the manufacturer's protocol. The PCR product was cloned using the pGEM-T-Easy kit (Promega) and sequenced using vector-specific primers. The transcription start site was identified by nested 5' RACE using the SMARTer RACE cDNA Amplication Kit (ClonTech) and the reverse primers 5'-CCTGAGACACAGAGGAACCAGAGGTACTG-3' (first PCR) and 5'-CAGACCAATCAGACGCTCC-3' (nested PCR). The purified 5' RACE product was directly sequenced using the nested reverse primer. Semi-quantitative RT-PCR on cDNA from adult tissues was performed using the following primers. USM1 - 5'-GGGGCACGAATGGGTGTTTATTC and CCTGAGACACAGAGGAACCAGAGGTACTG; USM2 - 5'-TGTTGGCAAGAAGGGTCAATGTCC-3' and TTCCTGAGAGGTACAGGTGTCAGTTATGC-3'; MSMB1 - 5'-GATTGCTGCTGGTCTCGTGACTACTG-3' and AGGATTTGGTGGGGTCTTCTTTATGC; MSMP - 5'-GGTAGTGGTCAATGGAGTTGCTGATGC-3' and 5'-ACTTCGGAGCCAGGATTCACCC-3'; GAPDH - 5'-CCTACTCCCAATGTATCTGTTGTGG-3' and 5'-GGTGGAACTCCTTTTTTGACTGG-3'. Amplification was performed using the following programme: 95°C for 1 minute; 35 cycles of 95°C for 15 seconds, 60°C for 15 seconds, 72°C for 30 seconds; 72°C for two minutes. Quantitative RT-PCR (qRT-PCR) was performed using the Brilliant II SYBR Green qPCR Kit (Agilent Technologies) and reactions run in triplicate on an Mx3000P thermal cycler (Stratagene). The quantities of tammar USM1 transcripts, using the primers 5'-GGGGCACGAATGGGTGTTTATTC-3' and 5'-CCTGAGACACAGAGGAACCAGAGGTACTG-3', were compared to the housekeeping gene β-ACTIN, using the primers 5'-TTGCTGACAGGATGCAGAAG-3' and 5'-AAAGCCATG-CCAATCTCATC-3'. Amplification was performed using the following program: 95°C for 15 minutes; 50 cycles of 95°C for 15 seconds, 60°C for 30 seconds (which included the plate read) and 72°C for 30 seconds. This was followed by 95°C for 1 minute and a dissociation curve of 55°C to 95°C, with a reading every 0.5°C over 30 seconds. Plates were discarded if more than one of the negative control triplicates was contaminated. Individual samples of a triplicate were also discarded if they had irregular melting curves or if the coefficient of variation was greater than 0.05 for the triplicate. If more than one of the triplicates was irregular the sample was repeated or discarded. In addition, a calibrator sample (d4-5 PY stage gravid endometrium) was also run across all plates to control for inter-assay variation, and the efficiency of each primer set was also determined. Analysis of the data was based on a modification of the 'efficiency-corrected comparative quantification method', which incorporates both the individual efficiencies of each primer set and the calibrator sample into the calculations . This gave a normalised relative quantity value for each sample, which was then used for the subsequent analysis. Statistical analyses were conducted using R (version 2.11.1) . A Shapiro-Wilks test for normality was performed to check the assumption that the data had a normal distribution. Since the distribution of the relative expression values was skewed, the data were log transformed for analysis. Log transformed data was analysed by one-way ANOVA with multiple comparisons of means compared using Tukey contrasts. For all analyses a significance level of p < 0.05 was used. Data are presented as mean ± SEM after converting back to non-transformed normalised relative expression. Sequence searches of Whole Genome Shotgun, Expressed Sequence Tag and Nucleotide databases were performed through the National Center for Biotechnology Information (NCBI) website  using BLAST and tBLASTn and modifying search parameters for stringency. Nucleotide and translated sequences were analysed using the MacVector sequence analysis software package. Protein molecular masses were predicted using MacVector's Protein Analysis Toolbox. Signal peptide cleavage sites were identified using the SignalP 3.0 web-based software  with default parameters. A tammar BAC genomic library (MEB1) was screened by PCR using primers 5'- GGGGCACGAATGGGTGTTTATTC -3' and 5'- GGAAGAGTGGAGGATGGATTTGAGG -3'. Illumina 454 sequencing was performed by the Australian Genome Research Facility. The longest assembled contig (89, 803 nucleotides) was submitted to GenBank [accession JN251945]. Translated sequences were aligned using ClustalW  within the MacVector sequence analysis software package. The unrooted phylogenetic tree was produced using Phylip (version 3.69) software  and running sequentially the programs protdist, neighbor and drawtree with default parameters. The tree was displayed and edited using Adobe Illustrator. Promoter analysis was performed by aligning tammar USM1 and opossum USM genomic sequences using Mulan online software http://mulan.dcode.org/ [62, 63] in 'TBA' mode. Conserved candidate transcription factor binding sites were identified using multiTF [63, 64] from the Mulan website, selecting the TRANSFAC professional V10.2 TFBS database for vertebrates, and selecting the "optimised for function" option for matrix similarity. We thank Scott Brownlees for assistance with animal handling and Brandon Menzies and Andrew Pask for helpful suggestions. SF performed bioinformatical analyses, semiquantitative RT-PCR and cloning. JF performed quantitative RT-PCR. BD performed BAC library screening. SF, JF, GS and MBR analysed data and prepared the manuscript. All authors read and approved the final manuscript.